Start Your Family Tree Today! Learn how to find your ancestors with FREE RESOURCES available on the internet. How and Where to Get Started. This book takes the beginner family historian from the basics of getting started with genealogy to the more advanced topics of research. Build Your Family Tree In Your Spare Time. Do family research with online resources in your spare time all from the comfort of your own home. "I knew absolutely nothing about searching for my family tree. Furthermore, having lived my entire life in the Midwest, I believed the history of Hispanos in the Valle was lost or of little significance to genealogists. How mistaken I was. The results of my Ancestry DNA spurred me to find out whence I came. Moises assiduously works to provide a blueprint of sources to help you find your roots. Very well organized with the goal of opening your eyes and your heart to a world that will surprise and justify your pride in your heritage." This book takes the beginner family historian from the basics of getting started to the more advanced topics of research. Seasoned family historians and genealogists are encouraged to jump through sections. Moises provides many resources and explains how he used them to find his own ancestors. And provides the reader with the links to the same resources that he used in order for you to do the same in your own research. "This is a very good book to help aspiring genealogist to get started on the right track. What I like most about the books are the links to valuable resources and the recommendations from the author." "Great resource, love how it's organized, easy to understand." 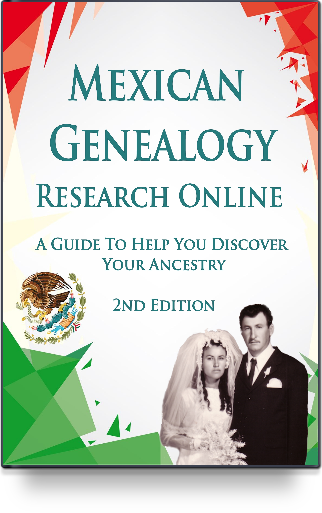 "An Indispensable Book for Anyone Researching Their Mexican Roots"
Learn what took the author years to learn, just in a few hours and avoid paying for records that are available free online. Don't pay someone to do your family tree, learn how rewarding and fun it is to learn to do it yourself!